Hayao Miyazaki’s final feature has been more than greatly anticipated. After a career spanning over two decades and ten wonderful features (not to mention various shorts, work on several television series and manga), Miyazaki has chosen to end his film career with perhaps the most ambitious project of them all. The Wind Rises (Kaze Tachinu) is far more adult than anything he has done before. It is a highly fictionalized account of the life of the aircraft engineer Jiro Horikoshi, bringing together elements of his life and that of author Tatsuo Hori (writer of a novel The Wind Rises). Set against the backdrop of some of Japans more devastating events – the Great Kanto Earthquake, The Great Depression, tuberculosis epidemics and WWII – this is a lovingly crafted, powerful tale of living life to the fullest against all kinds of adversity. Since he was a small boy, Jiro has dreamt of flying. Unable to become a pilot himself because of nearsightedness, and taking inspiration from the famous Italian designer, Count Caproni, Jiro studies hard and becomes an aircraft engineer. His talent is soon recognised, and he becomes one of the company’s top designers. We follow Jiro throughout the course of his life; through his imaginary, dreamlike encounters with Caproni, his days at university, his work at the company trying to design the best plane he can, and his romance with the love of his life, Nahoko. Throughout troubled times, Jiro tries to keep his head held high, and live his life as best he can. Flight, and the sense of freedom it brings, has long been a present theme in the films of Miyazaki though it has never been more prevalent than here. For Jiro, airplanes are dreams, and the animation truly captures that soaring, fantastical feeling. There is an absolutely tremendous sense of movement and grace and energy that is truly breathtaking. The film blends the ethereal and surreal (the Caproni sequences, scenes involving Nahoko) with elements of dark realism. Everything is beautiful. In many ways, The Wind Rises is far darker, emotionally and thematically, than previous Miyazaki works. The underlying tone of the film is heavily influenced by scenes of earthquake, fire, poverty and war – Jiro pushes on through life in a cheerful, upbeat manner, always working hard, but this is a history and a story tinged with sadness. For Jiro, his joy comes from creating, and not from victory in war or any kind of profit, and this is what makes him such an eminently likable character. There are scenes and instances both subtle and powerful, however, that constantly remind us of what a difficult time he lives in. The scene of the Great Kanto Earthquake is almost awe-inspiring in how shocking and horrifying it is. Then there are scenes such as when Jiro tries to give some hungry children some food, and they regard him with suspicion before running. Scenes like that leave a deep emotional mark. 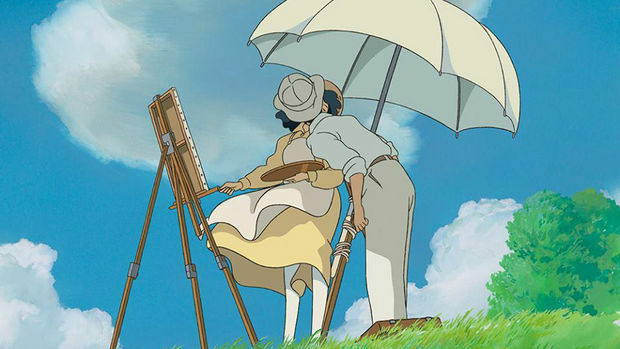 Amongst everything else that happens, The Wind Rises is also a heart-breaking romance. The romance between Jiro and Nahoko, who’s first fateful meeting occurs during the earthquake, plays out like a tragic fairytale. The love they share is so simple and pure, but circumstances are forever intervening. Still, with the two of them on screen together, the film brings about some of its most joyous instances. Between them, small moments become momentous. The Wind Rises is a more than fitting send off for one of the greatest minds the medium of animation has ever seen. Warm, emotional, sublime; The Wind Rises can surely take its place in the top tier of Studio Ghibli productions.